If you need a Bespoke Safety Sign, we can make it for you. We offer an incredible selection of materials and produce design choices already as part of our standard range. We also offer a sign customisation service that allows you specify your own message to display with a range of standard symbols. Sometimes there is a need for an unusual sign or there is a specific safety risk that requires the creation of bespoke sign. We have worked with a number of companies locally and internationally to develop the right signage solution for them. Unusual manufacturing processes, equipment or building layouts can give rise to some unusual safety risks. We have worked with a number of companies to help them make their workplaces safer. We recently worked with local buisiness, Genie. As manufacturers of very large lifting equipment their site leads to some unusual risks. 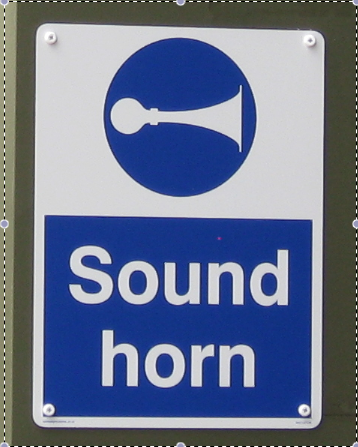 We worked with them on a full site sign audit and produced a full range of bespoke safety signs advising drivers to sound the horn at the exit to all of the site buildings. Extreme environments not only increase risks for employees and visitors but they also demand specialist sign materials to cope. We have produced signage to be used in all types of harsh environments. One of our largest projects was to find Safety Signage for an offshore oil rig. These signs needed to be capable of dealing with extremes of heat and cold, salt water and abrasion. Not an easy environment for a standard sign. We produced a range of bespoke marine grade Stainless Steel. We then coated these signs in a special automative laminate and heat sealed the signs. The signs then went under environmental testing before being fitted to the rig. If we can make signs to last in the North Sea we can use our Engineering heritage to produce a bespoke materials mix to operate in your environment. Food production environments require regular and aggressive cleaning. Normal signs under these circumstances would become illegible overtime. To overcome this we developed a bespoke material combination that allowed us to print the sign wording on to the back of a clear acrylic sheet. This meant that the sign wording was protected and could be cleaned, scrubbed or polished without damage to the sign surface. The final main theme for customisation and creation of bespoke signage solution is for design purposes. We have worked with architects and designers to produce bespoke safety signs with stainless, acrylic and other materials to co-ordinate in with design themes for everywhere from cruise ships to hotels. Custom CCTV Sign. Add your own custom text. Normal delivery times apply. Black on yellow CCTV symbol. Custom prohibition sign with prohibition symbol - circle crossed diagaonally through in red.